A bacterium moving in the water is equivalent to a man swimming in the sand, and a dolphin can move in the sea with the same ease of a bird hovering in the air. These considerations arise from the knowledge of the Reynolds number, a engineering parameter that allows to figure out which swimmers have a laminar or a turbulent flow. Dolphins are efficient swimmers and move through the water faster than fishes. 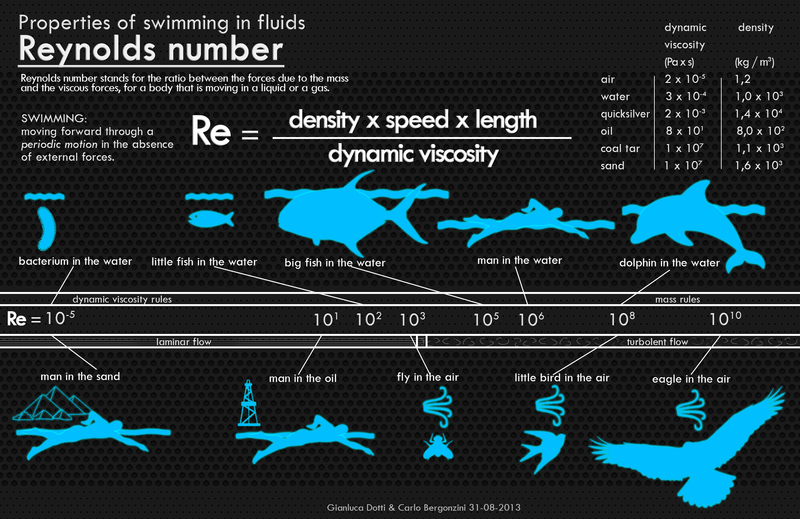 This is reason why their Reynolds number is so high, despite their length is comparable to that of a big fish. In just one second, dolphins can travel a distance equivalent to ten times their length. In the same time period, however, the bacteria in the water can move just a tenth of their size. The Italian version of this infographic is available here.